The Nets had their chance to pitch Camp Carmelo on their plans for the future when the two sides met at a Los Angeles restaurant, per ESPN. Nets owner Mikhail Prokhorov and minority owner Jay-Z spent the 40-minute session informing Anthony of the club’s short-term and long-term vision, centered upon their scheduled move to Brooklyn for the start of the 2012-13 season and their confidence in building a championship-caliber team around him, largely through free agency. Sources said Anthony was noncommittal after hearing the Nets’ presentation, declining to say whether or not he would sign the three-year, $65 million contract extension that New Jersey has established as a prerequisite for completing a trade with Denver. According to Yahoo! Sports Adrian Wojnarowski, the Nets were not confident after the meeting. After Carmelo Anthony sit-down with New Jersey ownership, “The Nets didn’t come away very confident,” a source briefed on meeting tells Y! 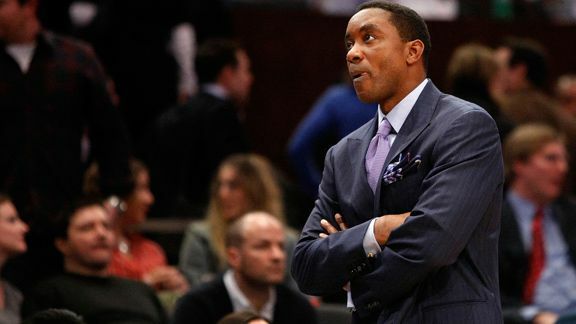 Wojnarowski also published a column early Sunday morning that outlines the growing influence that Isiah Thomas — yes, Isiah Thomas — has over owner James Dolan, who has taken over the Knicks’ trade negotiations with the Nuggets. Dolan has overruled Walsh in these trade talks and undermined his authority. Walsh has never wanted to give away Raymond Felton for an aging Chauncey Billups and throw Danilo Gallinari into the package, too. This is all Isiah, all his influence. This all comes down to Carmelo. While most stars wouldn’t want his future team to be gutted in order to acquire him — remember those Kobe-to-Chicago rumors from a few years ago? — Carmelo just wants the Knicks to give the Nuggets enough to get this deal done before Thursday’s trade deadline. He wants to play for the Knicks and he wants his three years and $65 million in security. A supporting cast is a distant third on his wishlist, apparently. Unless he’s suddenly willing to re-up with the Nets, he’ll be a Knick by the end of the week. As for the reemergence of Thomas as the de facto GM in New York — well, that’s just disturbing. Isiah can evaluate talent and had a pretty good run of drafts when he ran the Knicks, but in every other area of the job he was a complete disaster. Knicks fans have to be troubled by these recent developments. Ric Bucher says that any deal won’t get done until Monday because the league does not want the awkward situation of Carmelo playing in Sunday’s All-Star Game for the West, when he actually belongs to a team in the East.